What Is Apical Pleural Thickening? What Types of Diseases Decrease Lung Compliance? Bronchiolitis obliterans organizing pneumonia, also called BOOP, is a somewhat rare but serious lung disease. BOOP causes inflammation of the bronchioles, called bronchiolitis. This condition also involves the surrounding lung tissue. The alveoli, or air sacs, become plugged with connective tissue, preventing the respiration or the exchange of oxygen and carbon dioxide. According to MayoClinic.com, another name for this conditon is cryptogenic organizing pneumonia, or COP. Bronchiolitis is inflammation of the bronchioles and the surrounding lung tissue. Obliterans, or obliterate, is the occlusion of a part by degeneration, disease or surgery. Organizing refers to how the unresolved pneumonia forms in the tissues and alveoli, or air sacs. Pneumonia is the bacteria infection. So, BOOP is the inflammation of the bronchioles and surround lung tissue because of an unrelenting bacterial infection. In some individuals, BOOP does not cause any symptoms at all. In others, symptoms include a dry, nonproductive cough and breathlessness with exertion. Because of the bacterial pneumonia component, it can cause flu-like symptoms including a fever. Lung or breathing sounds through a stethoscope would sound like crackles throughout the lung. Crackles are heard upon inhalation when the alveoli are plugged and filled with fluid instead of air. BOOP can be the result of chronic inflammatory diseases such as lupus and rheumatoid arthritis, or from infections such as chlamydia, influenza and malaria. Certain drugs used for chemotherapy and radiation can cause BOOP. According to the American Association of Critical Care Nurses, immunological disorders, organ transplantation, radiotherapy, and environmental assaults such as smoke inhalation and mold can cause this condition. Diagnosing BOOP can sometimes be difficult, as most patients see their physicians because of flu-like symptoms. However, most patients complain of having these symptoms longer than they normally experience with the actual flu. Laboratory tests will not directly identify the condition. Lung sounds reveal the sound of crackles or rales through a stethoscope. An arterial blood gas will often show lower than normal blood oxygen levels, and spirometry will show a lower than normal lung volume. 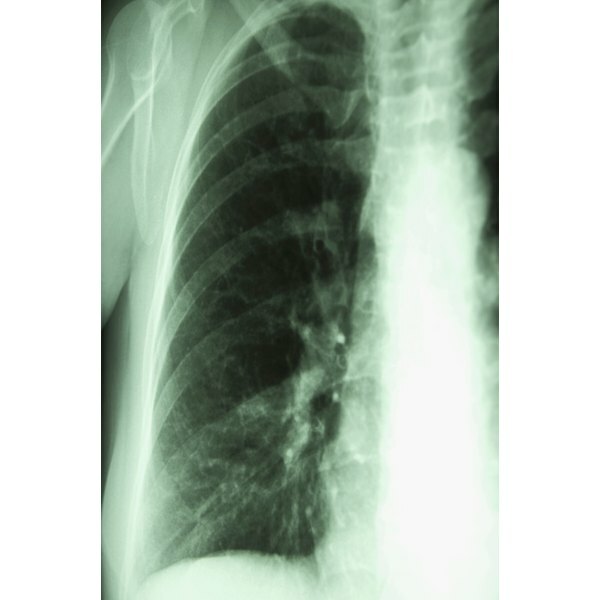 A chest X-ray often shows an extensive pneumonia with white patches in one or both of the lungs. It may take several weeks or even months of treatment to recover from BOOP, with prednisone being the drug of choice for this disorder. For some individuals, BOOP is resistant to treatment and gets worse. According to the Annals of Thoracic Medicine, BOOP can resolve on its own, but the majority of patients are treated with corticosteroids. However, approximately 30 percent of BOOP patients will have a relapse after discontinuing steroid treatment.